Heat 2 teaspoons oil in a large nonstick skillet over medium-high heat. Add chicken or tofu and cook, stirring every 2 or 3 minutes, until browned, 6 to 8 minutes total. Transfer to a plate. Tonight, I’m serving this Thai dish in bowls over some Jasmine rice, a side salad with ginger dressing (see recipe below) and fresh fruit compote. In a blender or food proessor, blend for 45 seconds. To prepare salsa: Combine tomato, onion, jalapeno, lime juice to taste, kosher salt and pepper in a medium bowl. Stir in avocado and cilantro. Add cayenne (if using). To prepare tacos: Combine flour, cumin, salt and cayenne in a medium bowl. Whisk in beer to create a batter. Coat shrimp pieces in the batter. Heat oil in a large nonstick skillet over medium-high heat. Letting excess batter drip back into the bowl, add the shrimp to the pan; cook until crispy and golden, 2 to 4 minutes per side. 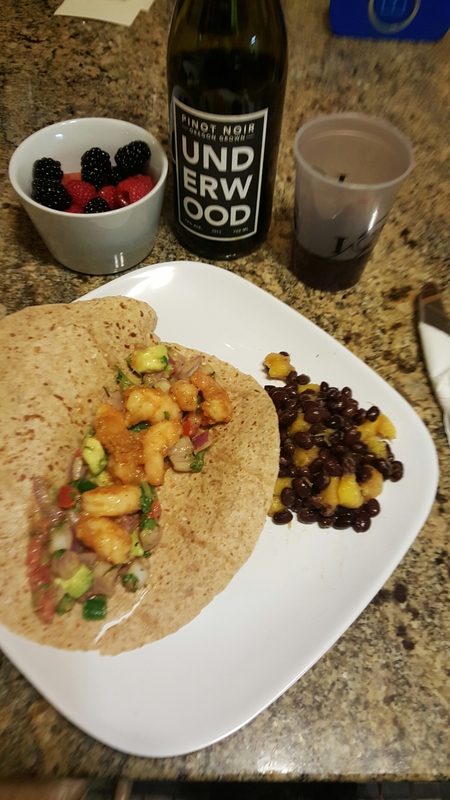 Serve the shrimp with tortillas and the salsa. In a large bowl, whisk together the EVOO, Tamarin (or liquid amino), balsamic, honey (or agave), garlic, fennel seeds, red pepper, lemon zest and juice. Preheat an outdoor grill or indoor grill pan to medium-high. Place the chicken in the bowl with the sauce and let marinate for 10 minutes, turning occasionally. In a large, deep skillet, bring 1 inch water to a boil and cook the asparagus for 2 minutes. Shock the asparagus in ice water and drain well. Grill the chicken for 12 minutes, turning occasionally; transfer to a plate and tent with foil. Grill the asparagus to mark evenly, 3 to 5 minutes. Slice the chicken and layer with the asparagus. Top with the scallions and drizzle with harissa sauce (or sriracha). Tonight I’m cutting out the Carbs by not serving with the traditional rice, instead I am platting this MYOTO dinner with a garden salad with a ginger sesame dressing and fruit compote. Tonight, I am serving with Green Beans wrapped in Applewood smoked bacon, Jasmine rice, garden salad and fruit compote. Heat olive oil in a large skillet on medium high heat. Add the diced pancetta and cook until lightly browned and crisp. Use a slotted spoon to remove the pancetta, leaving the rendered fat in the pan. Add the onions or shallots and cook until translucent and lightly browned (5 to 10 minutes for onions, if using shallots lower the heat to medium and cook a minute or two). Remove the onions from the pan, leaving the fat in the pan. Add the onions to the cooked pancetta and set aside. Put flour on a shallow plate for dredging. Pat the chicken cutlets dry and sprinkle both sides with salt and pepper. Heat the skillet on medium high heat. You should have about 2 tablespoons of fat in the pan from the pancetta, if not add more olive oil to the pan. When the fat in the pan is hot (test it to make sure by sprinkling a tiny bit of flour in the pan, it should sizzle), dredge a chicken cutlet in the flour on both sides, shake off the excess and place in the hot pan. Continue with as many cutlets as can fit in the pan without crowding. Sauté until just browned, on both sides. It should only take a minute or two. Cook all of the cutlets in the same way, adding more olive oil to the pan if necessary. Remove the cooked cutlets to a plate. Pour off any excess fat. Add the Marsala to the hot pan to deglaze it, scraping up any browned bits. Let the Marsala boil away until it reduces by a quarter or a half and stir in the cream. Let boil until the sauce thickens. Return the chicken cutlets, the pancetta and onions to the pan and turn to coat with the creamy Marsala sauce. Reheat for 1/2 a minute. Serve the cutlets with the sauce and a little freshly chopped Cilantro. 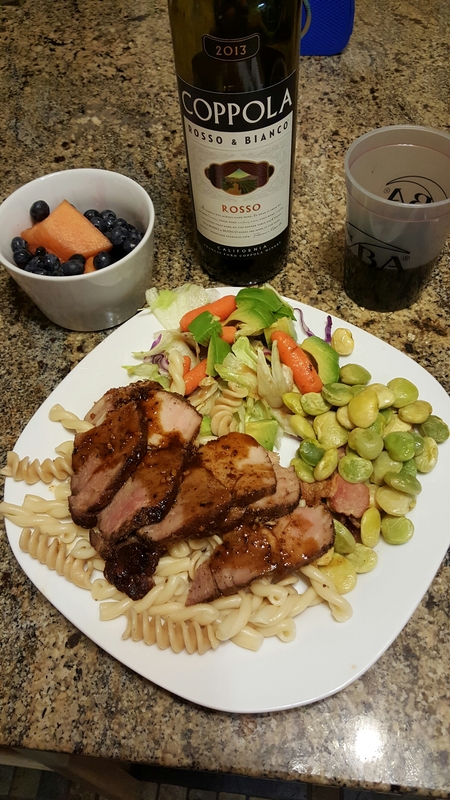 Tonight, I’,m serving with a little pasta, garden salad and fresh fruit compote. Preheat oven to 400°F. Lightly coat a 9-by-13-inch baking pan with cooking spray. Heat oil in a large nonstick skillet over medium-high heat. Brown ground meat, onion and cook, stirring often, until starting to brown, about 5 minutes. Stir in zucchini, beans, tomatoes, cumin and salt and cook, stirring occasionally, until the vegetables are heated through, about 3 minutes. Tonight, I’m serving with a fresh garden salad and fresh fruit compote. Peel onions and slice 1/2 inch thick. Arrange onions in large shallow baking dish and place pork chops over onions. Pour lime mixture over all. Cover and marinate 30 minutes at room temperature or overnight in refrigerator. Remove chops and onions from marinade and grill over medium hot coals about 15 minutes, brushing with some of the marinade. Serves 4. Tonight, I’m serving with Oven roasted potatoes, lima beans, garden salad and fresh fruit compote.